Thank you for stopping by Everything Orchids! As the name implies, I want to show you everything about how to grow these cuties, such as how to take care of orchids, how to choose a plant, how to grow one indoors or outdoors and what to look for in cut flowers, plus much more! There are myths about how difficult orchids are, but that’s totally not true. Most are super easy to grow. They have several basic requirements that can be quite easily satisfied. It does not take a high-tech greenhouse or a horticulture scientist to successfully grow and bloom these flowers. If I can do it, you can do it too! 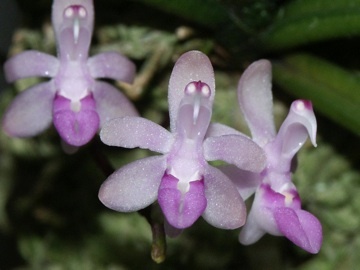 This website provides you a wealth of information on orchids and their cultivation. I have been growing these beauties for about 10 years now. Since my first little baby from Home Depot, I have been so fascinated how interesting and beautiful they are. Each type is so different from another—you have Phalaenopsis that looks like a moth, Brassia that looks like spiders, Paphiopedilum that looks like slippers—yet they all belong to the same family. Some of them have intoxicating fragrance, and some of them are so small that you have to use a microscope to see them. One thing you can be sure of—you will never get bored by them, because there are as many types as the number of stars! I never have a greenhouse and never have a big area to grow, so I have to grow them by the windows, under lights indoors or in my small balcony. It all comes back to my point—orchids are easy to grow. You don’t need an elaborate and fancy environment to satisfy their needs! You CAN grow orchids! Perhaps you just received a Cattleya as a gift and don’t know how to take care of it. Or you always like to grow plants and are interested in trying Cymbidium. Or you just want to grow a Phalaenopsis indoor to brighten the living space. Whatever the reason, taking care of orchids is easy, and I would love to share my passion and knowledge with you!